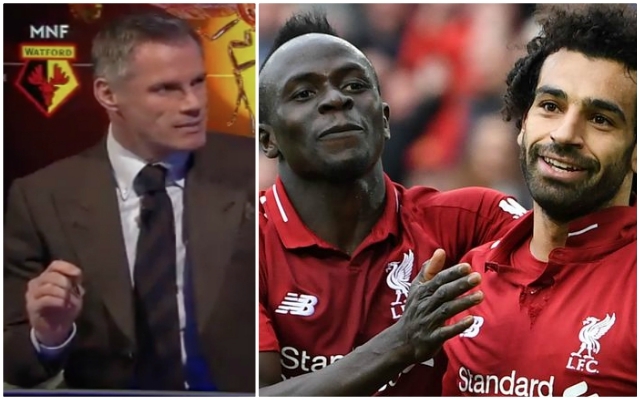 On Sky Sports Monday Night Football, Jamie Carragher called Sadio Mané the “best wide player Liverpool have had in years” and the best since John Barnes, as well as making a huge claim in relation to Mohamed Salah. Mané has been in stunning form for the Reds this season, netting 18 goals in the league and 21 in all competitions for his highest return since moving to the English game. That prompted Carragher to analyse his performances, form, and the significance of his goals. “It’s not just the goals he’s scoring, it’s the importance of the goals. The most important goal is that first goal and very rarely do we see teams lose or draw from that position. You go through Liverpool’s last 11 games and Mane gets the first goal in the top four games,”he eulogised. When interrogated by fellow pundit Gary Neville as to which player he would rather lose in our battle to claim the league title, the Scouser paused before replying: “Salah. They’ve got the same amount of goals and I’m a massive fan of Mane. “People talk about Jurgen Klopp and the signing of Salah, which has been unbelievable, and Van Dijk but Mane was the one that got Liverpool back up there,” the Liverpool legend boldy stated. Carra also claimed that Mané “sometimes goes under the radar. You’ve got Salah, Virgil van Dijk at the back, talk of the goalkeeper and the impact these players have had with Liverpool going for a first title in almost 30 years. Admittedly, Salah has been struggling to find the back of the net of late, but that world-class thunderbolt against Chelsea, plus the last-minute header which forced the Tottenham own goal, proves that the Egyptian is always a threat and perpetually involved in everything good we do. But he didn’t stop there. The former Reds defender then fearlessly went on to say that a wide player like Mané would have been the difference in us winning the league over Manchester United ten years ago. “If we had Sadio Mane in that side in 2009, we probably would’ve won the league. That was the only thing that was really lacking and the difference between the two sides. “I’m not just talking about these teams, go back through history of the teams who win a title, the wide players stand out massively. “If Liverpool or City win the league, it is going to be down to the wide players,” he added. It’s hard to say whether we agree with Carra on this to be honest. Of course, Mané has been instrumental to all our recent success, but Mohamed Salah has been of irreplaceable, talsimanic importance to us too. Luckily, it doesn’t look like we’ll lose either of these two for the final run-in.